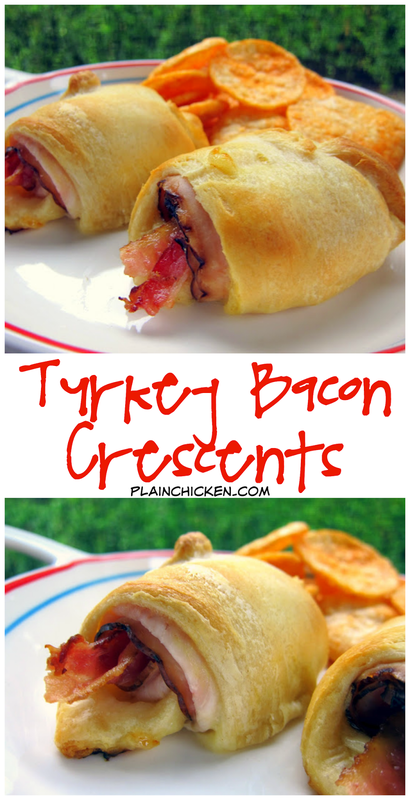 Turkey Bacon Crescents recipe - super quick hot sandwiches - only 5 ingredients - SO good! Quick weeknight meal that is ready in 15 minutes. SOOO much better than an ordinary cold cut sandwich. If you follow my blog, you already know that I love to make hot crescent roll sandwiches. I even added a separate category for all the crescent recipes I've made. You can check them all out here - crescent recipes. These turkey bacon crescents were a huge hit. I'm not a big turkey fan, but I used Boar's Head Honey Maple Turkey from the deli and it was great! These crescents are so much better than a plain ol' turkey sandwich. We both gobbled them up (get it gobbled - ha, ha). I reheated the leftovers for lunch the next day and they were awesome. These would also be great for a football tailgate! Separate dough into triangles. Spread each triangle with 3/4 teaspoon honey mustard. Top each with turkey, 1/2 slice of cheese and 1 piece of bacon. Roll up loosely. Place on cookie sheet. Bake 18 to 20 minutes or until golden brown and cheese is melted. You definitely make excellent use of pre-made doughs and these appear to be no exception. I really like your shots of them. Nice thing about bacon, it makes even turkey breast taste good. Oh my... YUMMILICIOUS:) Thanks for sharing the recipe AND making me hungry! Have a blessed day, HUGS! These look really yummy! Thanks for sharing! I read the title before looking at the ingredients and picture and thought this was a crescent for "turkey bacon" and was prepared to turn my nose up. Thanks for proving me wrong and providing yet another afternoon snack for my children! I have made the ham and cheese crescents before but I like your recipe. It's a nice change. Oh those look so GOOD!!!! Wow... we can eat this all day! Made these for lunch today- they were great! Thanks for sharing your creations! Another yummy recipe from Plain chicken. Thanks for sharing!! !